Gracias por acompañarnos en Oktoberfest 2017. Esperamos que haya disfrutado de la presentación de la máquina transfer rotativa Eclipse 12-100. Si tiene preguntas, no vacile en comunicarse con nosotros por teléfono o a través de nuestra página de contacto. We will present, for the first time anywhere, the new Eclipse 12-100, a unique 12 station Rotary Transfer machine. 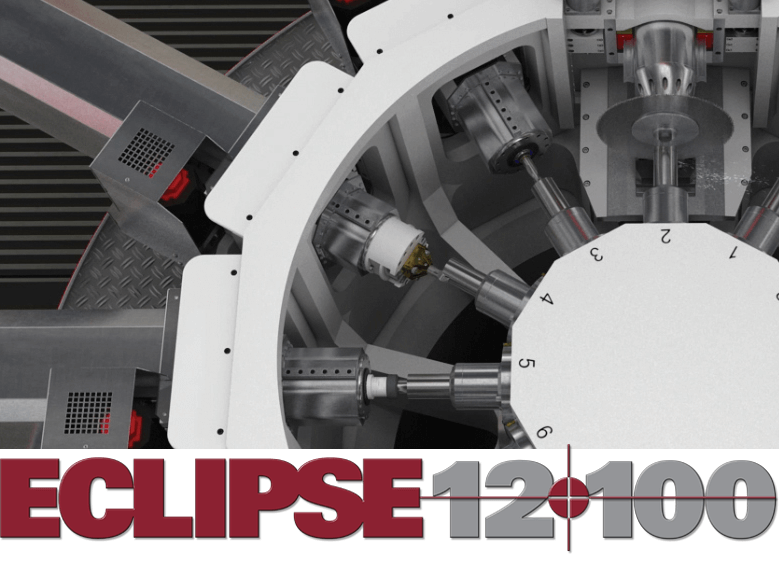 The Eclipse is a ground up re-design of our famous Rotary Transfer machine, with all new components. The machine has a heavy casting mounted on a frame of sturdy, welded, steel construction. The machine casting is 2m in diameter, nearly twice as large as the traditional 12 station Hydromat machine. This new ductile iron casting is designed for the use of semi-permanent tool spindles, each having 3-axis capability as standard; eliminating the need to change tool spindle sizes for different cutting processes or adding 3-axis flanges for that capability. The new Eclipse features all electric servo spindles and slides. No hydraulics are needed for tool spindle motion as in previous Hydromat machines. These new technologies along with the beefier base yield better accuracy and repeatability.